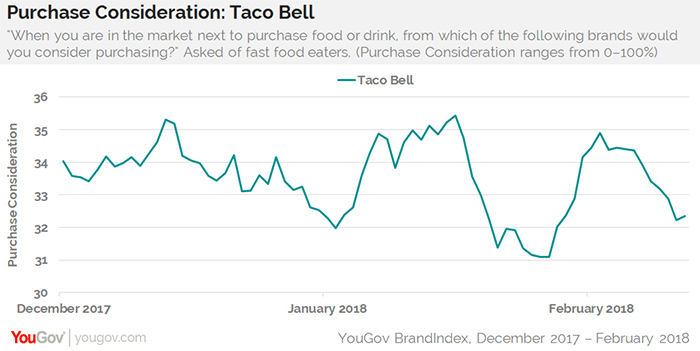 Both Taco Bell’s one-dollar menu rollout in early December and Nacho Fries launch in late January align with bump ups in potential sales revenue among fast food eaters, but show little to no sign of sustaining, according to YouGov BrandIndex. Taco Bell’s ad campaigns for the rollouts increasingly registered with the brand’s target audience from late December, when 28% of fast food eaters said they’ve seen a Taco Bell commercial in the past two weeks, to the middle of February, when 39% reported the same. However, despite the significant rise of Taco Bell’s ad awareness, its Purchase Consideration metric has looked like a roller coaster. Each two-week rise is followed by a one-week drop, as the novelty of new prices and items apparently wears off with fast food eaters. For example, when the Nacho Fries debuted on January 25, 31% of fast food eaters said they’d consider visiting Taco Bell the next time they were in the mood for something to eat or drink. By February 2, that percentage had risen four points to peak at 35%, where it hovered for another four days. Taco Bell’s Purchase Consideration score is now back down to 32%.